Brigid’s Way 9 Day Pilgrimage Faughart — Kildare. 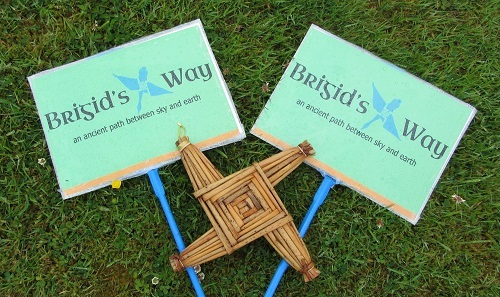 By following Brigid’s footsteps and those of our ancestors, this ancient Brigid pilgrim pathway between heaven and earth seeks to remember, reactivate and reconnect people with the sacredness of the land in Ireland. Starting with a Ceremonial Fire and Water Blessing of Pilgrims at Brigid’s Well, Upper Faughart, Co Louth you may partake in the full 9 days pilgrimage, or as many as you are called to, as they wend their way over the sacred Hills of Slane and Tara, through Donadea Forest Park and along the Grand Canal to Brigid’s Fire Temple and Wells, Co Kildare.